CUSTOM APPROACH - At Signlanguage, each sign is treated as a completely new and unique project. We only use the highest quality material available to meet the requirements for each specific request. Full color UV-inhibited custom painted murals can be applied to truly differentiate your sign. Many of our signs are adorned with sculpted steel, projecting a dramatic dimensional appearance. UNSURPASSED QUALITY - Our wooden signs are made from top quality wood products such as Clear Heart Redwood or Mahogany. If wood is not the best option, we suggest High Density Urethane, Expanded PVC or other materials. 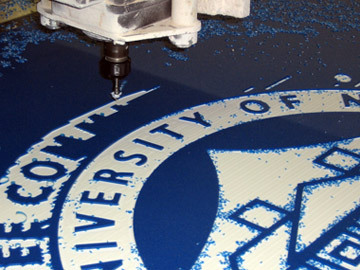 Each custom sign receives the best finish available to ensure a beautiful, long-lasting image. We reinforce the signs to ensure they maintain a high quality image for years to come, and back that up with a full 5 year Fit and Finish Guarantee. EXCEPTIONAL SERVICE - With each quote, we offer at no charge, preliminary designs, a description of what materials the sign will be made of and a description of how the sign will be made. We make on site appointments for quotes and provide timely, expert installation to meet your exact needs. EXPERIENCE - We have over 25 years of experience making high quality, unique custom signs with virtually no limit to our capabilities. Please View our Gallery of Signs to see examples of our signs. If you don't see your type of sign listed, rest assured we can make it. Make Old look New Again! Is your current sign in need of Restoration or Repair? 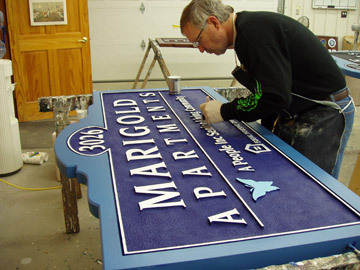 Click here to check out our Sign Restoration program. Please contact us today and discover the impact you can make with a Signlanguage custom sign! the Buffalo, Rochester, and Greater Western New York area for over 30 years. Signlanguage, Inc. leading the way in quality custom business signs.